Figure 3.13. Diagram of FcRn structure showing binding of IgG and albumin molecules. Albumin and IgG are bound non-competitively. Figure 3.14. Recycling of IgG molecules by FcRn receptors. Figure 3.15. The relationship between IgG half-life and serum IgG concentration. (Copyright © 1969 Karger Publishers, Basel, Switzerland) . 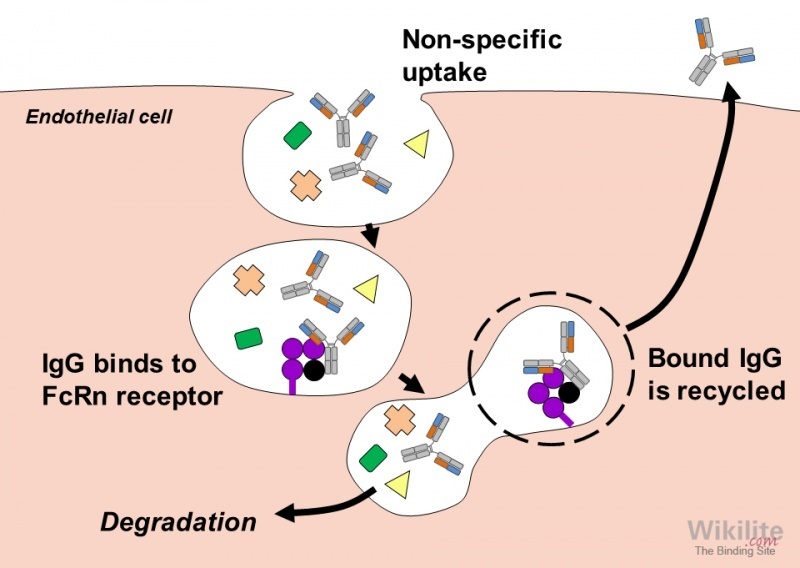 Under normal circumstances, most serum proteins that are too large for renal filtration (> around 60 kDa) are removed by pinocytosis, a process that occurs in all nucleated cells as they obtain their essential nutrients from plasma. This accounts for the half-life of IgA and IgM, which is constant at around 5 - 6 days. By contrast, IgG has a concentration-dependent half-life of approximately 21 days due to recycling by FcRn receptors . These receptors have a structure similar to Class I MHC molecules with a heavy chain of three domains and a single domain light chain comprising β2-microglobulin (Figure 3.13). FcRn receptors are functional in most nucleated cells, including renal podocytes, which may account for the presence of IgG in the urine at high serum concentrations (Chapter 24) . These are the same receptors that transport IgG from the pregnant mother to the developing foetus in the last trimester of pregnancy. The heterodimeric FcRn molecules protect both IgG and albumin from acid digestion in lysosomes, recycling them back to the cell surface (Figure 3.14). Interestingly, IgG and albumin molecules do not compete for the same sites on the receptor, although the exact mechanism and sites of binding are unknown. In the absence of functioning FcRn receptors, as in patients with familial hypercatabolic hypoproteinaemia (a disease associated with a genetic deficiency of β2-microglobulin), the half-lives of IgG and albumin are only 3 days. Such patients have hypogammaglobulinaemia, not from failure of production, but simply from excessive catabolism. 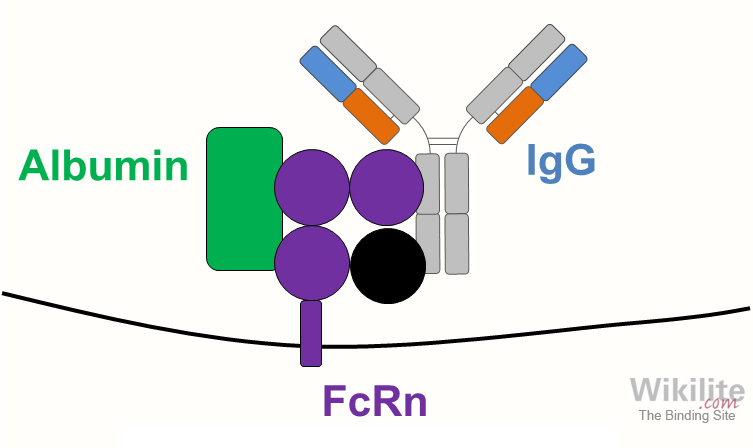 At high IgG concentrations, the FcRn recycling system can reach saturation and the half-life of IgG falls as there are insufficient FcRn receptors to protect all IgG molecules (Figure 3.15). Hence, a patient presenting with, for example, a monoclonal IgG of 90 g/L is producing far more than 3 times the amount of IgG than a patient presenting with 30 g/L of IgG. In contrast, at low IgG concentrations, when FcRn receptor protection is maximal, the IgG half-life extends to several months. Serum IgG concentrations may therefore be an unreliable indicator of tumour production rates in patients with IgG MM (Chapter 18). What accounts for immunoglobulin light chain heterogeneity? What are the normal serum half-lives of IgG and FLCs? Do urine FLC concentrations always increase alongside rising sFLC concentrations? Why does the IgG half-life vary with concentration? IgG is approximately 21 days and FLCs 2 - 6 hours (Section 3.4). No. If there is significant renal impairment, urine FLC excretion falls (Section 3.4). 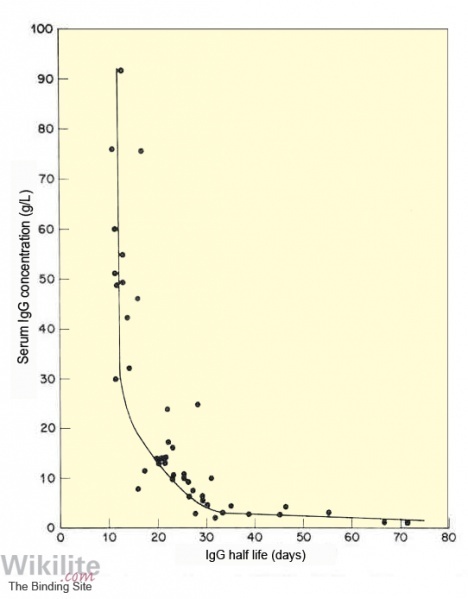 FcRn receptors saturate at high IgG concentrations so the half-life shortens (Section 3.4). At low IgG concentrations, the half-life lengthens because FcRn receptor recycling is maximal (Section 3.4).